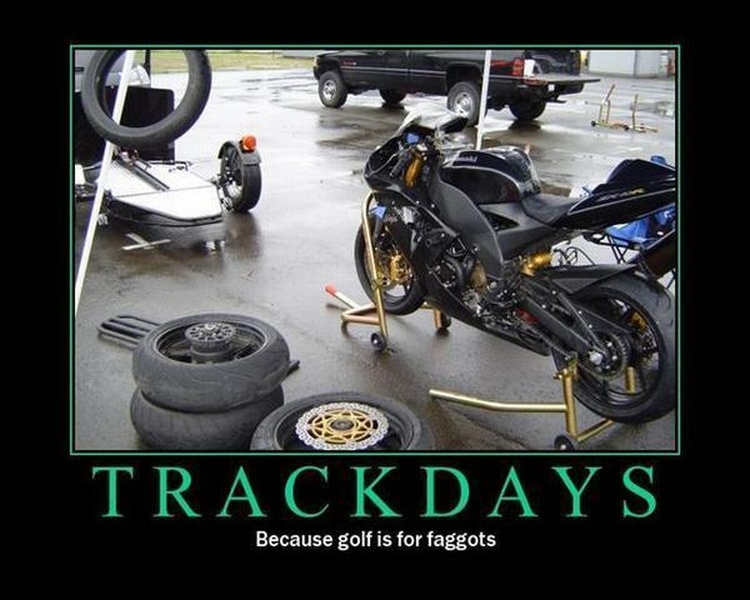 Home of the Unofficial Brunei Bikers Club | …because golf courses should be Motocross tracks! We had a very dusty ride to Sukang today. There is a fair and good gravel road all the way up there, so we found out. We first missed the turn to Sukang and turned around to take the “old” road we know. The road was in bad shape and we were happy it had not rained for a while. In Sukang we checked the GPS and found out that we almost made a circle. Took a side road on our way back and found the “new” gravel road again. We had been only a few kilometers off Sukang at first. Anyway we had fun. Ron and Richard were impressed by the maps I brought. Found them on the Brunei Government Survey side. Have a look yourself. (Once in, click on maps on the left.) You can buy maps as well at there office in Berakas. Did not have a look myself, but might try it later. See you later, Jan Sanders. Two friends, Rick Cole and Ken Watt, and I recently realised a 10-year-old ambition of ours – to reach Bario in the farthest depths of the Sarawak jungle. We regularly make back-country trips to far-flung villages, longhouses and places of interest by motorbike. The more remote the better, but Bario, a Kelabit village nestling on a highland plateau behind the Tama Abu Ranges and Gunung Murud (7,950ft – the highest point in Sarawak) near the Kalimantan border, remained unknown to us, despite our previous attempts to reach it from several different directions. At the beginning of July, armed with new information on a possible route tracking the Baram River to its source, the three of us set out from Miri. After a 100-km ride inland the public road ended and we entered the logging areas where the roads are built and maintained by timber companies. A unique right-of-way system is used on timber roads, which helps the fully laden logging trucks stay on the strongest part of the road. The side which you have to drive on is indicated by arrow markers and it changes from side to side with the topography. It can be a hair-raising experience to round a corner on the wrong side and come face to face with an empty logging truck thundering straight at you. One and a half days and 420km later we reached the end of the road, literally. At Pa Bareng on Sg Dapur, everything bound for Bario must be unloaded and taken by boat one to two hours upriver. That is, anything that has managed to get that far! Even though Bario is only accessible by air, boat and on foot, they have 4WD vehicles, bulldozers, excavators and tractors; all bought up by boat in pieces and reassembled. We were lucky to find three small long boats at Pa Bareng loading bags of cement to ferry up to Bario (for a new water treatment plant) and they were able to give us a ride on top of the cement – the bikes were left under a hut on the river bank. The Kelabit people of the Sarawak high country are into long ears. Shoulder-length ear lobes are achieved by wearing heavy earrings. The Kenyah people who live lower down river boast long lobes and ‘bowl’ haircuts, plus unique hats. The last truly nomadic people in Borneo are the Penans, who wander from hunting area to wild sago plantation and carry what they need with them. Fixed abodes are not for them. We were humbled to meet one Penan man who had walked for two days from his jungle district near Pa Tik over the ranges to Bario to register his kids for school; people from Kalimantan walk a similar distance to Bario for basic supplies like salt and sugar. Staple planted food in Bario is highland rice and ‘ubi kayu’, or tapioca, supplemented with jungle fare. We dined that night on rice, pakis, a ferny-type vegetable and heavily peppered barking deer. At 3,500ft elevation there is no need for air conditioning in Bario, indeed the locals don jackets and hats at night when the cool air sets in. The next morning, our boatmen showed us around the village and the local market before ferrying us back downriver to our bikes. We rode for five hours to our overnight stop at Long San, visiting the Kenyah village of Lio Matoh on the way for fuel. A swim in the muddy Baram served as our shower that night and the Williams sisters were on television, playing the Wimbledon Finals after dinner. Early the next morning, we began the long haul to Miri and then back to Brunei Darussalam, thus completing a round trip of some 1200+km. Job done! Dazza – all the riding pics can be found under the “Blogroll” (scroll down a bit on the right hand side). Some bad news, we have one of our newer riders injured. I don’t believe that any of you need reminding about the potential dangers. None of us likes getting hurt particularly, or seeing each other get hurt. Aside from ruining a good day, the recovery time really gets in the way of having fun. 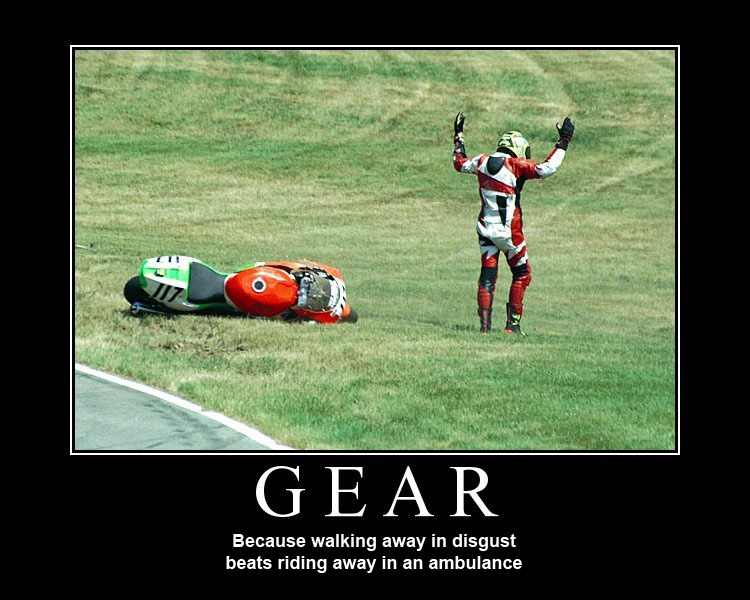 Dress for the wreck and not for the ride – protective gear serves a purpose, use it. Don’t go riding alone – if you get into trouble, it could be fatal. Ride within your abilities and in line with the conditions – just because you’ve seen David Knight or Ricky Carmichael ride, doesn’t mean you can ride like them. Inform someone where you are going riding and give them an estimate of when you expect to return. Carry identification and contact numbers – when you are badly concussed, you might not remember your own name. Respect out neighbours – we are very privileged here and have little restrictions on riding areas. Don’t be the idiot that ruins it for everyone. Look well ahead – if you don’t know what is up ahead, you’re better off slowing down to a safe speed. Check out the following from the MSF for some more tips/hints. …in short, don’t be an arse and use your melon! Okay, so the write up is a bit late and I’ve probably forgotten most of what we did, but the great memories remain. Here is a brief summary of the adventure. The trip started with Ant, Max & Rich heading off over the border to Miri to start the lengthy journey to the tours start. A few surprises at the airport, when they wanted to charge us large sums of cash for the excess weight. Some cunning Scottish skills from Max ensured that we repacked and managed to get on board without a penny being paid. A quick stop (well, a few hours) in KL and the boys were well on their way to missing the flight to South Africa. Luckily, we managed to stay sober enough to get a cab and make it to the airport in time. Ant didn’t quite get to see the Proton do 180km/h! Many hours later, we touched down in Johannesburg, only to find they didn’t serve beer at 08h00! Damn shame! What are they going to do when all the boys turn up in 2010 for the Football World Cup. On to Cape Town where Dave met us at the airport. By now, Neil and Andy were about ready to take their comfortable Singapore Airlines flight and meet up with us a day later in East London. On to Dave’s to repack our gear for the week and get some refreshments. Max got introduced to biltong, or ‘roadkill’ as he termed it. A few mouthfuls later, I could barely keep the bugger from eating it all. The weather was not looking good, with rain on the way and looking like it was heading all the way up the coast. An early start and off we went in Dave’s bus headed for East London. It was raining when we left and rained the whole way to East London, with little let up. We finally met up with Neil and Andy at the ?? Hotel, where they had settled in to watch the Welsh get stuffed by the Springboks. Needless to say that after their hours in the bar and supping the local brew, they were well on their way. Next stop, Morgan Bay for a few more beers, some food and a few hours of shut eye. The preparation was good, a few weeks back I did a trip in with Andy Shaw and the track was perfect, no rain for a couple of days before made the ride easy and an absolute hoot. This allowed us to get to the very end of the trail and I got the gps route right up to the border. The down side was it was fkin hotter than fkin hot thing on heat! which meant we weren’t fit enough to go bush walk to try and pick up any trail that may lead to the Sarawak side. We were also not sure if we had enough fuel to get back if it started to rain and we ended up having to ride back in a mud myer. As it turned out it didn’t rain but Andy ‘hippopotomus’ Shaw went for a wallow anyways. ‘Walter’ add some photos and do the SA write up you light weight. Some of the guys headed over the border for some fun. Here is Ken’s writeup from the trip. This Sarawak trip was planned for a total of 4 days to enable those interested to ride to Ba’Kelelan and over the Indonesian border to Lg Midang and Long Bawan. When the weekend arrived for the trip, only three riders where able to join. They were Max on his hi tech Yamaha WR450, Ken on the trusty Suzuki DR600 Paris/Dakar (the pig) and Rick on the workhorse, Honda XR600. Friday 11th April, Max trailered his bike up from Kuala Belait and after a small sight seeing expedition of the back streets, finally met Ken and Rick at the Kuala Lurah border check point. Our first stop was Limbang town for passport control chop and it was here that Rick informed us that the Honda had no front brake. A closer inspection found that the disc brake pads and brake pin had fallen out along the route. Ricky decided to return to Brunei for some quick repairs and meet us in the morning at Lawas. Max and Ken continued uneventfully to Lawas and arrived at the “Southern Comfort Bush Lodge” which is located 15 kms on the Lawas Damit road. Our lovely host Isty, had prepared a fantastic feast that night, and Max and Ken gladly finished off Ricky share in his absence. Saturday morning was a casual start preparing the bikes, loading up with fuel, packing our gear and waiting for the Rickster to arrive from his fun night stay in Limbang. The group set-off around 10 a.m. and after crossing the local stream nearby the lodge, they followed the 4×4 goat track for a few kms until meeting the main “Samling Logging” road. This great scenic track passes through Long Sukang, Berayong Logging Camp and traverses the steep trail to “Merarap Hot Springs Bush Resort”. The group stopped briefly for lunch in the company of Alfred Padan, the owner and operator of this fantastic lodge. After our brief chat and lunch, the bikers set off again on the main “Samling Logging road” passing through Merarap Logging camp, Ravenscourt Logging camp,and through the remote area of Mount Belingi on the way to the beautiful valley of Ba’ Kelelan. The group had to contend with deep muddy sections of trails and ruts on the decent over Mt Belingi. Exhausted, the riders arrived late afternoon at the “Apple Lodge’ located opposite the landing strip at Ba’Kelelan. Ba’Kelelan is famous for it’s locally grown rice and delicious apples which grow in this cooler climate at altitude. The lads enjoyed their nights stay with plenty of food provided by the Apple Lodge and a few soothing beers afterwards at the classy, local Astro T.V. entertainment venue. Sunday morning, the lads were up early and re-packing their bikes in preparation for the trip over the Malaysian border to Kalimantan, Indonesia. They had all been praying for a dry night (not beer!!) and a sunny day. If it had rained, it would have been impossible to leave the Ba’Kelelan valley and climb Mt Belingi on the return trip home. On departing Ba’Kelelan, the group rode their bikes along the buffalo trail around the perimeter of the airstrip fence, to the Malaysian Army check point. After a brief chat and a photographic session, permission to proceed was granted on identification. For previous bike trips this service had cost us 5 ringitt each. The trail then continues for approximately 7 kms through “no mans land” until reaching the Army Check point and tiny village of Long Midang, Kalimantan, Indonesia. Although this bike group turned around at Long Midang, on a previous bike trip the group traveled the further 10 kms to the village of Long Bawan (still in Kalimantan, Indonesia). More photos and greetings were exchanged, before back tracking through the villages Panang Kelalan, Panang, Lg Muda, Lg Komap, Ba’Kelelan, Lg Ritane, Lg Rusu, Buduk Bui. Before them lay the 3 km steep and muddy climb back up and over Mt Belingi. With a few reservations, plenty of sweat and a bit of luck, the riders finally conquered this incredibly difficult mountain trail. The trail then passes through remote jungle and takes in spectacular views of Mt Murud and Batu Lawi Mountain. Mt Murud (7950 ft), the highest peak in Sarawak, can be reached in 1 hour by a 4×4 logging track from “Ravenscourt” Logging camp. Batu Lawi (6703 ft) is a spectacular sight with its vertical limestone twin peaks rising 300 mtrs above the rest of the mountain and is unique to the Island of Borneo. There are many legends, myths and superstitions surrounding Batu Lawi, but translated into the Kelabit dialect it means “fish-tail rock”. The return journey home had the riders passing though “Ravenscourt Logging camp”, “Merarap Logging camp”, and an overnight stop at the “Mererap Hot springs Resort”. Max had decided not to stay the night and returned to Brunei alone. Under the guidance of the resort owner and operator Alfred Padan, Ricky and Ken where taken to the original Belvedere Helicopter (R.A.F.) crash site. Many parts of the aircraft still remain today scattered under the jungle canopy. The aircraft crashed during the Indonesian Conflict in the 1960s killing all on board. Thought y’all could use some motivation!! Due to buyer pulling out of sale, my WR is up for sale again. Well looked after (usual scuffs from riding offroad). According to some, it must be in great condition (as its never been in 4th gear ;). Compared to Max’s; its brand new! All usual WR450 mods done to improve performance, etc. Well lubed/greased/serviced. Oil changed every 3 to 5 hours. Spare airfilters and some extra oil filters. Around 40 hours use/1700kms. One of only 2 in Brunei and road legal. All this for the bargain price of B$12,000 ($5,000 below what they are new, if Liew can even get one!). Call me 814-1939. Nobody? And all the usual suspension fluids, octane boosters and industrial air compressor oil (piston, screw and vane)etc. “Now settling in back here in the land of neeps, haggis and a pint on the way home from work. The KTM was ready for me when I got back to the house and has had a few trips up into the mountains, despite the winter. I will post a few when I can get my hands warm enough to take some photos – I do have heated grips fitted – really cant remember why we did not fit those in Brunei. That last trip was an experience that will be difficult to forget (not sure how Richard remembers any of it after that ding to the head. Those Yarpies are tougher than they look. I would be happy if someone would send tyre changing instructions through, bit short of a tyre changing chappy out on the trail. Looks like no more lounging round the pool with a Magners post ride either – have to settle for a fireside and a dram. It has been a complete blast guys, and I will try to join the Enduro Africa with you all if the calender fits. Hey guys and girls! Next weekend I am free for the whole weekend (23rd and 24th)and would love to hit the jungle if anyone keen for a spin?? Also if you know anyone that needs to get out of the house and they don’t have a bike remember I have a spare one at home they can grab. Ok that’s it from me so give us a yell. Time someone else added a blog – I’m getting tired of being the only one to add them. get busy you slackers!! Possible ride on Sunday 3rd Feb.
Quick summary of the first ride for 2008, or in Roy’s case, probably his last ride before he departs for the cold weather back in Aberdeen. A hastily planned ride, with most folks only returning from holidays on the 4th of Jan. Jezza offered to driver recovery, as well as Pat and his mate Darcy. Ant was his usual self and unable to make the planned departure time – apparently some work emergency with one of the rigs or platforms (probably due to him forgetting to weld something ;). We started a little further down the road this time in an effort to save tyres. Some cunning plan, as it also offered the opportunity for leaving the 2 trailers secured in front of Max’s car (he doesn’t want to get it dirty – smart man). We finally hit the road sometime after midday. The road was in fair condition considering the heavy rain that had fallen in the previous week. A few more ruts, but nothing too bad. We all got to the fork in the road without too much effort. Max, however, was less than amused at having rocks tossed at him by one Ritchie (aka Rooster Doyle). Compounded by the fact that he had also forgotten to bring his helmet liner (nice and clean, but back in Panaga), he was less than impressed. Hell hath no fury like Max roosted!! Recovery vehicles caught up with us a bit later we set off to make our way to Melilas. Conditions started to deteriorate, but were still fairly okay. At the Melilas bridge we were suitably impressed by the newly built bridge (given the previous time it was non existent). Okay, bridge may be pushing it, but a careful scattering of trees, branches & logs had been fashioned into something to make the river passable. Pat & Darcy got clear and almost to the bridge, when big Jezza and the Pajero beached themselves in a mud-hole. What transpired was around 2 or so hours of digging, back filling, rocking, pushing, towing and generally throwing everything at them to try and get the car out. Needless to say, Jezza wisely sat firmly in the drivers seat and barely moved. Pat got stuck in and was covered from head to toe in foul smelling mud and clay in no time. Ritchie and myself eventually headed to Sukang to seek assistance. Well, assistance was not to be found. In fact, the road into Sukang had been slightly flooded. Like a sucker, I volunteered to walk through the crossing to see if it was passable. It was, but there were spots that were a little deeper and rutted out than others. Ritchie got across without incident and my bike stalled and refused to start half way across. On trying to get back, I found that the side of the road was non-existent and ended up nearly dropping the bike into shoulder high water (would not have been good). Assistance was not to be had, but the locals were happy for us to stay the night if we could make it there. We headed back to see if one Pajero had gotten unstuck, or if Jezza had managed to extract his arse from the drivers seat. Well, neither had happened! Luckily, Ant finally made a showing. Being his usual self, he decided that we were all crap and he could pull Jezza free. Despite some wise advise, he jumped right in and promptly found himself stuck! Thankfully, getting his little Suzuki free was far easier. Prepared for the trip, we made quick use of his finest Chinese winches and slowly started getting Jezza out. By the time we were done, Melilas was not an option, as it was getting dark and would not have made it there in time. Sukang it was. Max decided that he would ‘go and check on the progress’ of the others crossing the water and promptly found out that his big tank works well as a flotation device. Too bad his engine was all that keen on running under water. After a good swim, he pushed his bike into the village and started the process of getting his carb free of water (oddly enough, engines don’t run all that well on water). The locals decided that his backfiring engine and spluttering was a signal for them to get the fireworks started, so much like the previous visit, we were treated to some fireworks whilst Max coughed and spluttered his way back to life. Jezza & myself had gotten a fire going and started the dinner BBQ. The evening ensued with usual activities of sitting around, talking shite, playing cards & having a laugh. Sleeping was a different matter, as I can assure you, a hardwood floor is really hard! A mattress or 2 would not have gone amiss – not to mention a set of earplugs. The sounds of the jungle bugs were soon drowned out by all and sundry snoring their heads off. I reckon the locals must have thought we were cutting the village down with all the noise. Morning came way too quickly and camp was packed in minutes. Breakfast consisted of a muesli bar (thanks who ever brought those!) and pulling on wet smelly gear from the previous day’s ride. I snagged a pair of dry socks from Ritchie – not that they made any difference, as my boots were soaked. We set off to check out the way to Melilas. Roy (who had had all sorts of smart advise about crossing water) headed off first. Thankfully Darcy had his camera ready on the other side. The pictures tell the story, plain and simple. He blew it and took an early morning bath. Max having had a good swim the night before was feeling fresh and ready to take the water on, so gave Roy no time to get going and belted passed him, nearly making Roy fall in a second time. I took a more sedate approach and headed though slowly. Ritchie saw the camera and thought it an opportune time to get a photo of him on the back wheel. At the Melilas turn off, we left the recovery boys behind (not wanting to get Jezza stuck again!) and headed off towards Melilas. The ride there was pretty good going and a few of the washed out bits on our previous visit had been repaired and filled in. we met all the folks from the village, had a bit of a chat, drank some of their tea. A few geologists from Indonesia were having a look for coal. Roy informed us that we needed to carry coal with us to give to the people we meet in the New Year (some odd Scottish tradition, apparently). The road back was all going well, until I got to about 200 metres from the bridge. Coming over a rise, I had picked the line that was not the right one. On the other side, it was deeply rutted out and not forgiving at all. I recalled Ant’s famous advise to “just ferking nail it”, but it was in vain. The rut monster reached up and ripped me from the bike. A few stars later, I found myself nicely pinned under the bike, while hearing the other bikes disappear over the bridge. Roy came back to look for me, by which time I had gotten out from under the bike and shaken off the cobwebs. My helmet was (is) history, but not major damage to me or the bike. Needless to say, the ride back to the original departure point was somewhat slower than previously. We all made it back without further incident (unless you count Jezza getting stuck again!). It was back to Roy’s to clean the bike and cars. Max sat around slagging Jezza off for getting stuck, then promptly managed to find himself getting stuck in the garden. All in all, a great weekend and a good laugh. Thanks to all those who played a part in organising (that’d be everyone) and for the guys driving recovery. A great ride for Roy’s last weekend out in Brunei. As usual, there are some pics from the trip in the blogroll. Well, weekend ride was on, despite the conditions. Mad Max has got a story or two to write, so we’ll wait for his update. In the mean time, pictures have been updated. Full set of from the infamous Kampong Sukang & Kampong Melilas, as well as some from the Labi road ride (just missing Bengi’s pics). Check out the links in the ‘Blogroll’. Once again – cheers to Richard for driving recovery (despite him having to be rescued by the bikers!! ), as well as Rachael & Bengi for keeping him company and taking the photographs. If you are selling your motorcross bike then leave a post here. I am interested in anything over 250 cc. and in on&offroad bikes. For those of you who have registered and gotten approval, you CAN add new posts, not just comments. Go on – be adventurous and add some content instead of me doing it all!